It's the 2nd Annual Family Fitcamp on Monday the 23rd at 7pm. Tell your friends, family, neighbors and co workers etc....I'm hosting a fun family fitcamp for all ages at Buri Buri School in the MUR! At fitcamp, folks can get a great workout along with encouragement and motivation to continue working out even after fitcamp. Ultimately it's about feeling amazing after exercising. Come and learn more! Healthy snacks and water will be provided. All families are encouraged to join! 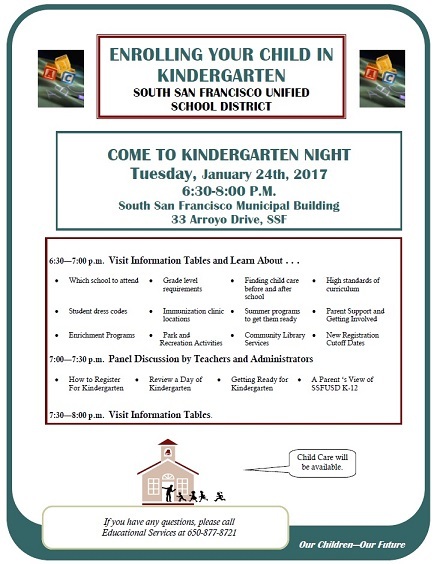 The SSFUSD is having an information night for incoming kindergarten and transitional kindergarten families this Tuesday night at 6:30pm at the SSF Municipal Building at 33 Arroyo Drive. Learn all you need to know about enrolling your child in school and preparing them for kindergarten. LEAP Registration Begins Friday 1/20/17 at noon! Welcome to this fun musical instrument class! Students will learn to play the ukulele and contemporary songs. We will introduce proper technique and beginning songs. The class will present a performance on the last day of the program. · 2. Click on the orange "Register for Classes" button at the top of the page. 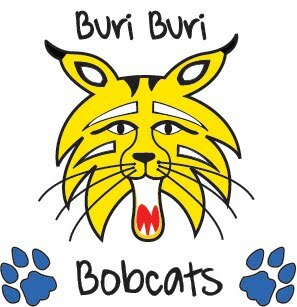 This will take you to the Daly City Partnership Reso page where you can choose “Buri Buri School” and the class you want and complete your registration. Reso offers curated kids' camps, classes and activities in the greater Bay Area for kids of all ages. Whether your kids are interested in sports, nature, arts and crafts, or science, Reso makes it easy to give them the best experiences. Discover and book amazing local activities for your kids at www.reso.io. Reso makes it easy to #WinYourDay. January PTA Updates: Restaurant Night, PTA Meeting, Family Fitcamp! This week at Ono’s Hawaiian BBQ, located at 970 Serramonte Boulevard in Daly City on Tuesday, January 10, 2017, from 2:00pm – 7:00pm. Come get some spam musubi snacks for your child(ren) after school, and pick up a meal for an easy dinner.These Restaurant Night fundraisers provide a wonderful opportunity for Buri Buri families to meet other Buri Buri families in your community. Enjoy great food in the dining area or take it to go if you wish. We need lots of help with these events so please join us if you can. This is a great way to get experience with the PTA and contribute to our amazing school community. No experience necessary! Refreshments will be served. Come to the MUR for a fun family exercise night. Kids welcome, bring a yoga mat or towel if you have one and wear comfortable clothing. Healthy snacks will be served. Look for flyers sent home next week about our annual walk-a-thon! This year we will be fundraising to bring music and arts programs to school!